The invited speakers include L. Aurichi, B. Braga, C. Brech, K. Devlin, N. Dobrinen, A. Dow, C. Eagle, V. Fischer, O. Guzman, M. Hrusak, I. Juhasz, P. Koszmider, W. Kubis, P. Larson, M. Magidor, J. Moore, Y. Peng, D. Raghavan, A. Rinot, D. Soukup, and A. Tornquist. Poster presenters should bring their posters and put them up themselves. The Fields can provide tape and advice as to where to put them. There will be a separate event for graduates of the seminar on May 12th. The local organizing committee consists of Franklin D. Tall (lead organizer), Ilijas Farah, Juris Steprans, Paul Szeptycki, Stevo Todorcevic, and William Weiss. The conference secretary is Mateusz Olechnowicz. We don't have the final schedule yet, but the conference will start around 10 on Monday and end early afternoon on Friday. The registration form is now available online here. The registration fee is \$90 Canadian (approximately \$70 U.S.). There is no registration process at the conference. Please register online and a booklet and nametag will await you on a table in the Fields lobby. Some support is available for graduate students and postdocs outside Toronto, especially U.S.-based ones. Apply by sending a c.v. to the above address, and by asking your supervisor to send us a recommendation letter. Graduate students and postdocs at York University and the University of Toronto can ask their supervisors to pay their registration fees from NSERC operating grants. The conference dinner will be held Thursday, May 16th at Le Sélect Bistro, an excellent French restaurant. You can sign up through the registration form. If you have already registered for the conference and now want to register for the banquet, that can be done by revisiting your registration. Alternatively, speakers can bring a flash drive or their own computer, but the last alternative might raise compatibility issues. The price of accommodation in Toronto has risen sharply. May is a peak season, so you need to book this as soon as possible. If you can't find anything reasonable near the Fields Institute, a good alternative is to find a place easily accessible by public transit. In general, west of the Fields is considerably cheaper than east of it. There are streetcars on College St, Dundas St, and Spadina Ave, as well as subway lines under Bloor St and Yonge St, each of which will bring you within walking distance of the Fields. Please be sure to ask for the University of Toronto corporate rate if booking at the Holiday Inn-Carlton. The rate is about $220/night, including taxes. 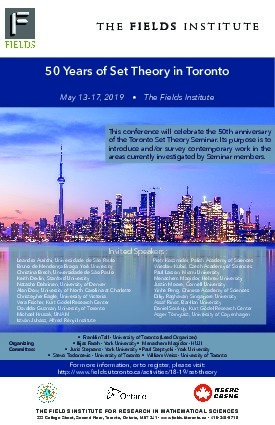 If you are still looking for accommodations for the conference in May, Massey College (a graduate residence on the University of Toronto campus) rents rooms in the summer. It will not be possible to book anything until early April (exact date of availability not yet available) but they will definitely be renting rooms for the dates of the conference. If you are interested, please start checking the website https://www.masseycollege.ca/summer-rentals/ starting in April until it becomes possible to make reservations. To be safe, book something else now that you can cancel if you succeed with Massey (which only has about 20 rooms). Those needing Canadian visas should apply well in advance. We can supply letters of invitation upon request. Using Set Theory and Model Theory for the CIA in the Post-9/11 World. What do mathematicians do now that machines can "do (all) the math"?